Tags: crusaders, event, merci, mix-up, merci's, 2018. 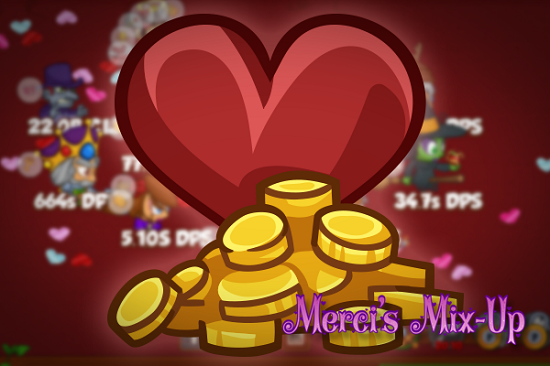 The Merci's Mix-Up 2018 event runs until Tuesday, February 20th at Noon PST. 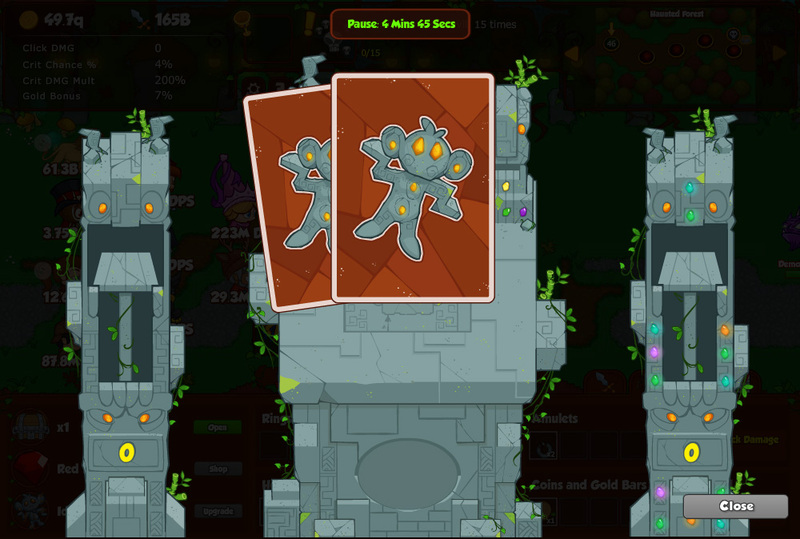 For more information, check out the How to Play /FAQ in-game! Frankie the Demon Crooner is a debonair singer like no other: when he sings nearby Crusaders are empowered, gaining a boost to their DPS, and the more quickly monsters are defeated the greater the buffs Frankie bestows – up to a limit. If you haven't collected them already, you can unlock our Tier One Crusaders Rocky the Rockstar and Sally the Succubus by completing the respective Tier One objectives. Then, you can collect the Tier Two Crusaders, Warwick the Warlock and Katie the Cupid, by completing the first two Tier Two objectives! Recruit Frankie the Demon Crooner | Frankie takes up a slot in the formation. His demonic singing disables the DPS of all Crusaders within 2 slots of him. He moves around the formation every 50 areas. Reach area 500. Swoon | Only Frankie and female Crusaders may be used. Reach area 600. Three's a Crowd | All Crusaders reduce the DPS of adjacent Crusaders by 50%, stacking additively (aka more than 1 adjacent Crusader = 0 DPS). Reach area 650. Lovesickness | Every area a random Crusader is affected (if possible) by Lovesickness, which disables their DPS and Formation Abilities. It lasts for 30 seconds and spreads to an adjacent Crusader of the opposite gender every 15 seconds (2 spreads per infection). 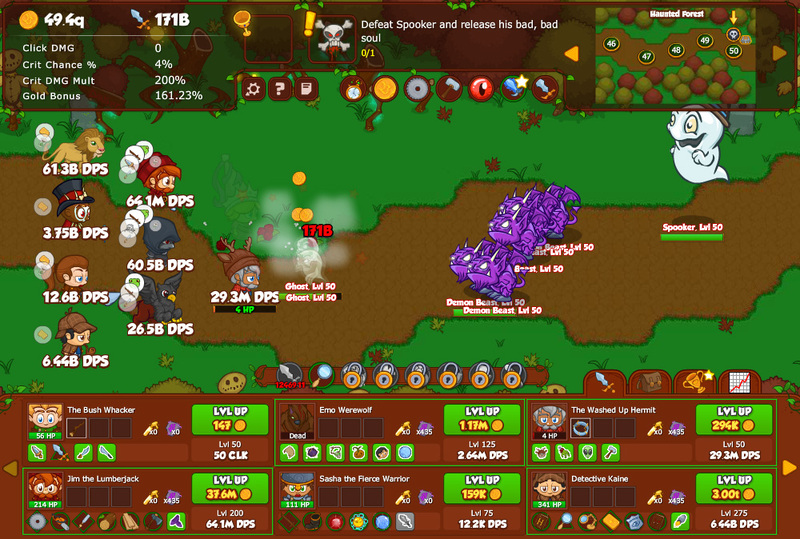 Crusaders cannot be affected by Lovesickness for 2 minutes after it expires (either from spreading or from entering a new area). Lasts through area transitions. Reach area 700. Matchmaker | Every 15 seconds one female and one male Crusader are randomly chosen from those in the formation. 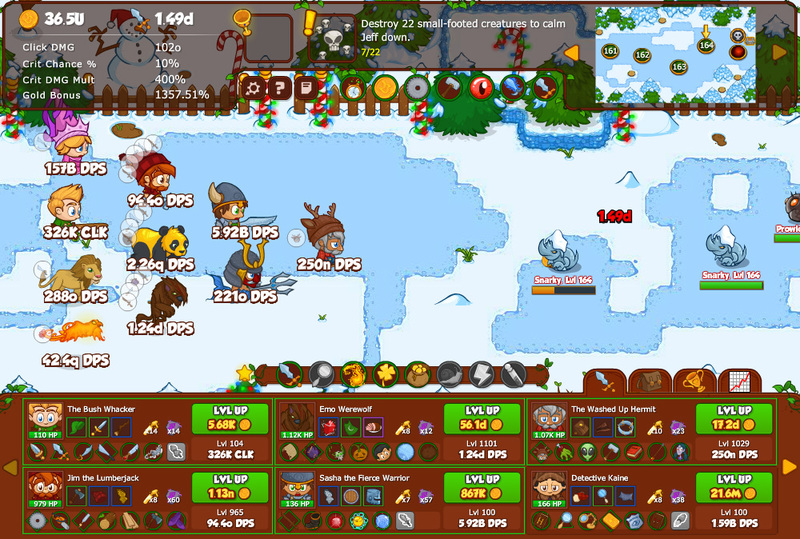 Those are the only Crusaders who do DPS for the next 15 seconds. (protip: can force one pick if you only have one male or one female in your formation). Reach area 750. 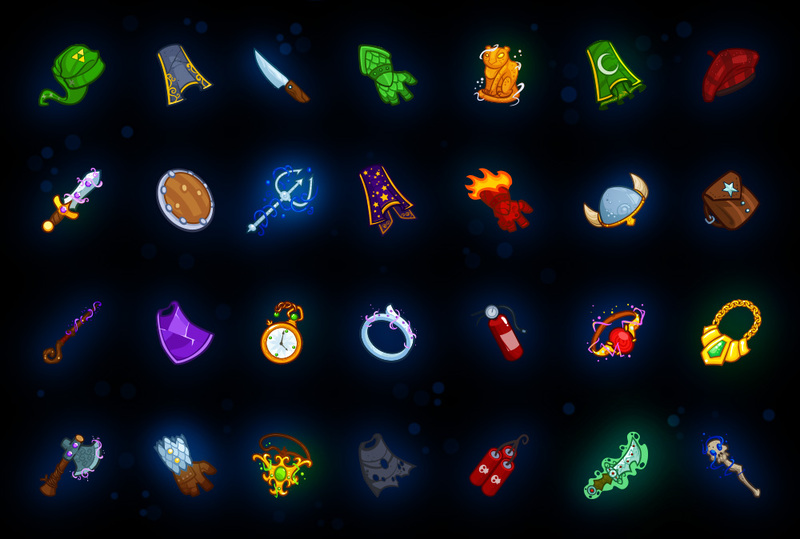 Equipment for event Crusaders can be found in Valentines Silver and Jeweled Chests, which you can earn from objectives and the free play or buy in the shop. Each non-recruitment objective will drop a chest for its given tier of Crusaders, and free play will drop all-tier chests. Gear for the Tier 2 and 3 Crusaders will only appear in all-tier chests once you've unlocked the respective Crusader. You can select the tier of chest you buy in the shop. You'll have until Tuesday, February 20th at Noon PST to complete the Valentines event! 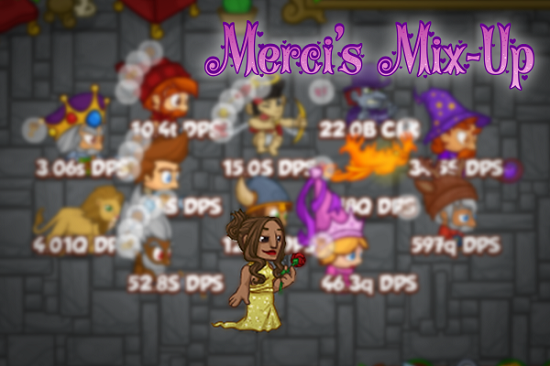 Tags: merci, mix-up, event, crusaders, new, warwick, katie, warlock, cupid. Love is in the air again and to celebrate the most romantic date in the calendar, we're relaunching the Merci's Mix-up event. 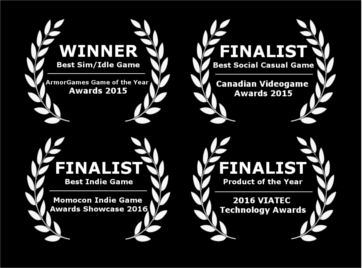 This time with two new Tier 2 romantic leads and three new Tier 2 objectives. It's time to get romantic. 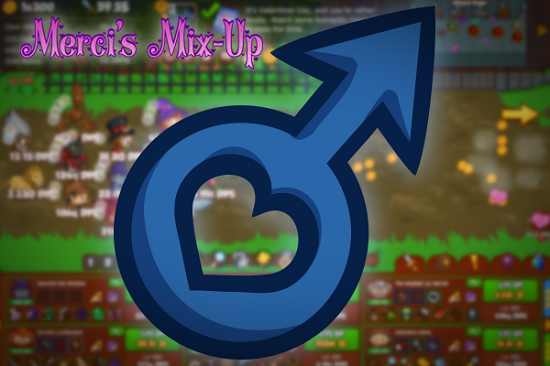 The Merci's Mix-up event runs from today through to February 21st at Noon PST. For those players who haven't unlocked them already, this is your chance to add both Rocky and Sally to your roster. Of course, as this is a 2017 update of the original event you can also collect two new Crusaders: Warwick the Warlock and Katie the Cupid. New Tier Two Crusader: Warwick the Warlock. The first of the two new Tier 2 Crusaders is Warwick the Warlock. This mischievous leprechaun replaces The Bush Whacker as the main clicker. At level 100, his ability Soul Harvest spreads the click damage to all enemies in a small radius around your click. At level 400, Warwick unlocks Curse of Weakness where enemies damaged by your clicks take 100% more damage from your DPS for 5 seconds. New Tier Two Crusader: Katie the Cupid. After you've completed the first new Tier Two objectives for Warwick and Katie, there are three more objectives to keep you busy. New Tier Two Objective: The Bachelorette. In The Bachelorette a bachelorette takes up a spot in your formation. Every 25 levels, she sends one bench seat packing (in a fixed order), making it unavailable in subsequent levels all the way to area 400. New Tier Two Objective: It's Raining Men. In the objective, It's Raining Men only male crusaders are allowed. That's it. Do your best Weather Girls impression and fend off all your new admirers to reach area 450. New Tier Two Objective: The Cost of Love. The final new Tier Two objective is The Cost of Love. 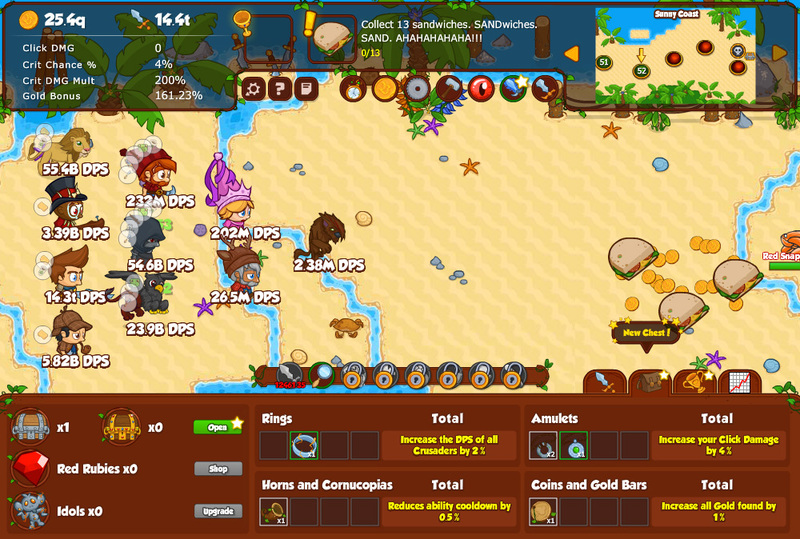 Now Crusaders cost much more than normal and enemies drop less gold until you beat area 500. Equipment for both Tier 1 and 2 Crusaders can be found in Valentines Silver and Jeweled Chests. However, gear for the Tier 2 Crusaders will only appear once you've unlocked the respective Crusader. You'll have until February 21st at Noon PST to complete the event. Let Love Rule!